Rob Baxter’s Exeter Chiefs will use this week to ready themselves for a straight shoot-out with one of European Rugby’s top guns, Munster, to see who will advance out of Pool Two in this season’s Heineken Champions Cup. With their aspirations seriously faltering after three rounds of battle, Devon’s finest have recorded back-to-back, bonus point victories against Gloucester and Castres to give themselves a more than fighting chance. Just four points separate leaders Munster and the Chiefs heading into the final round of action next weekend. Thomond Park will be packed to the rafters as the two-time Kings of Europe prepare to face off against Baxter and his Chiefs, who warmed up for that encounter by easily dispatching Castres on home soil. Exeter dominated from start to finish, producing arguably some of their best rugby of the season so far to run in six tries on the day. The returning Jack Nowell claimed the first, before team-mates Joe Simmonds, Jonny Hill, Tom O’Flaherty, Henry Slade and Luke Cowan-Dickie all got in on the scoring act. Castres, who had won the earlier meeting between the two clubs back in October 29-25, grabbed consolation scores through Taylor Paris and Thomas Combezou, but that was scant reward on a miserable day, which was compounded when prop Tudor Stroe was sent off in the second half by Irish referee George Clancy. Knowing nothing less than victory would suffice for them, the Chiefs were quickly into their groove. Despite making nine changes to their line-up from that which had seen off Bristol Bears in the Premiership the week previous, it was a razor-sharp opening from the home side. Just three minutes had elapsed when Nowell, returning to the fray at full-back, collected possession just inside the Castres half. Still with much to do, the Cornishman set off on a mazy run that not only left a trail of destruction, but left a catalogue of defenders grasping thin air as he waltzed his way to the try-line. Nowell’s on-field wizardry was simply spell-binding, underlining his undoubted worth to the Chiefs moving forward. Home cheers, however, proved short-lived as Castres responded within minutes. They used their pack to punch their way into enemy territory, before quick ball allowed fly-half Benjamin Urdapilleta to loop a pass over Nowell – and there was Paris waiting to apply a simple finish in the right-hand corner. Urdapilleta’s testing touchline conversion cannoned back off the post to ensure the scores remained level, before the Chiefs once again kicked into overdrive in attack. A clever snipe from Nic White caught the visitors napping and when Hill raided on the subsequent follow-up, the towering Exeter lock was denied by some stout, scramble defence from the visitors. With the resultant scrum, though, the Chiefs did find their way over for a second score. Playing with the advantage after Castres had strayed offside, the ball was flung out wide to Devoto, whose sublime offloaded allowed Simmonds the easiest of roles to run in from 10 metres out. Sadly, the young playmaker could not convert again. Up and running, Baxter’s side continued to pile forward at every opportunity. Indeed, some of their offloading and skills were, at times, simply breathtaking. The tempo the Chiefs wanted to play at was red-hot and when they threatened again on 30 minutes, their efforts were rewarded when the hulking frame of Hill powered over from close range for a third try, converted by Simmonds. Three tries already in the bag, now the Chiefs wanted to wrap up the all-important bonus point by the break. Urged on by a vociferous home crowd, O’Flaherty’s initial break gave them the forward momentum, before the ball was shipped along the Exeter back-line. It reached the hands of Santiago Cordero, whose drop of the shoulder and fast feet Castres will get to see plenty more of next season when he moves to Bordeaux-Begles. His departure from Devon will be a loss, but between now and then he will continue to deliver for the Chiefs. It was offloaded to Matt Kvesic that saw the Chiefs advance yet further, but when it appeared they were primed to strike, Henry Slade knocked on with the line in sight. It would have made for a wonderful score, but it mattered little as the Chiefs were still firmly in control of proceedings at the break. Indeed, Slade made light of his rare error, producing the quality to set up Exeter’s bonus point score just four minutes into the second period. Feeding off a penalty advantage, the England international took hold of possession, dropped a shoulder, turned on the after burners, before firing a grubber kick in behind the Castres defence. It set-up a foot races between O’Flaherty and Paris with the former showing the speed to claim his maiden European try, applying a brilliant finish in the left corner. Simmonds again obliged with the extras, stroking over a conversion from the left flank. To their credit, Castres responded almost immediately. The introduction of Rory Kockott at the break certainly gave them fresh life, but it was after a lively break from David Smith, that the visiting pack were able to work the opening for Combezou to glide over for the try, converted by the boot of Urdapilleta. That, however, would be as good as it got for the defending French champions as the Chiefs quickly got back into their groove. Slade was the next to claim a converted score, edging over from close range after White had caught Castres unaware by switching back down the blindside. And the day got no better for the visitors as Stroe was dismissed for illegal use of the fore-arm to Ollie Devoto's head at a ruck. The intervention of TMO Olly Hodges alerting Clancy to the actions of the replacement prop. With the man advantage, the Chiefs rammed home their authority just past the hour mark when Cowan-Dickie was the beneficiary of some determined work from the Exeter pack just five metres out. Job done, all that remained was for Baxter to nurse through his players without injury, and start prepping the folder for next week’s trip to Limerick. 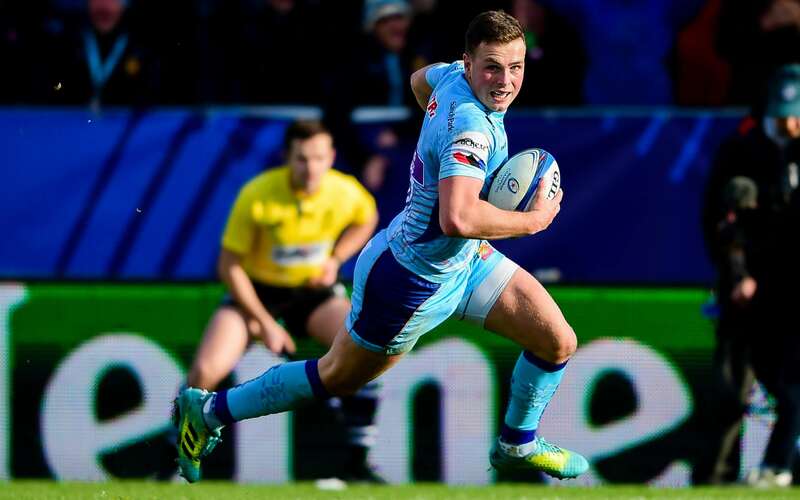 Exeter will travel across the Irish Sea knowing they can claim a prized scalp with a similar victory on Saturday – and what a way that would be to celebrate advancing with Europe’s elite. Chiefs: J Nowell (I Whitten 55); S Cordero (I Whitten 16-25), H Slade, O Devoto (G Steenson 67), T O’Flaherty; J Simmonds, N White (J Maunder 63); A Hepburn (B Moon 53), J Yeandle (capt, L Cowan-Dickie 53), T Francis (H Williams h/t); D Dennis (M Lees 55), J Hill (S Lonsdale 59); S Skinner (J Hill 67), D Armand, M Kvesic. Castres: G Palis; D Smith (A Tichit 61), T Combezou, R Ebersohn (capt, F Vielle 53), T Paris; B Urdapilleta, L Radosavljevic (R Kockott h/t); A Tichit (T Stroe h/t), J Jenneker (K Firmin h/t), D Kotze (M Clerc 53); L Jacquet (S Mari 62), T Lassalle; C Gerondeau (A Jelonch 53), B Delaporte, M Vaipulu (A Tulou 53).